SPECIAL OFFER : If you are pre-booking the journeys and don't want to do all the work, we will book the first set of tickets for you for FREE! Book your pass with us and let us know your itinerary at the time of booking (within 24 hours of purchasing the pass) - We send you your pass and your tickets in the email for you to print and travel. You can also do it all by yourself! Want to book a 4 journey pass? Book your pass with us and let us know your route. We will book the first set of 4 tickets for you without you having to do anything! You only pay if you want us to change / cancel / book any more tickets etc or want this service after 24 hours of purchase of the pass. First 4 tickets are absolutely FREE service from Palace Tours as long as you give us the exact dates, preferred time and travel routes within 24 hours of purchase of your pass. The Pass is active for 6 months from the date of purchase and is valid during 1 month from the date of your first ticketed reservation. Prices are in U.S. Dollars and include all taxes and the operators administrative, handling and service fees. The Renfe Spain Pass is personal and non-transferable and must always be presented together with a valid passport. It is valid for all AVE high speed Long Distance and Medium Distance trains (excluding Trenhotel, international routes and other overnight trains). The holder must present a valid passport together with the pass and the ticket in any inspection operation. The pass is for individual use. If you purchase multiple passes, there is a possibility that everyone in the group traveling together may not be allocated a seat next to each other when booking over the internet. Usually if the bookings are done almost simultaneously, it may be possible that the seat allocation might be near each other but there are no guarantees. If it is important for you to ensure particular seat allocations, we recommend you consider purchasing individual tickets with P+ or higher class. After 24 hours, and prior to first use, a 20% cancellation charge and administrative fee will apply. It is not possible to obtain any refund whatsoever after making the first journey. If the journey is made in an inferior class to that specified on the pass, the holder will not be entitled to any compensation whatsoever. If a pass is damaged, lost or stolen, a duplicate can be requested free of charge at the ticket offices of authorized stations. It is not possible to change a pass for another one of a different type/class. It is not possible to change a pass for another one with a different validity period. The Renfe Spain Pass is active for 6 months from date of purchase; it becomes effective for a maximum of 1 month starting from the date of your first travelled reservation. Ticket reservations are required in advance and must be made online or at station ticket offices free of charge. The Pass and your passport must be present at the time of ticket reservation. Should you require additional assistance, Palace Tours can make your ticket reservations, however there is a service fee of $ 5 per person for each ticket reserved. Each ticket reserved reduces the remaining number of trips available on your Pass. The holder must present a valid passport together with the Pass and the reserved ticket in any inspection operation. The ticket allows you to complete your trip by commuter train provided that it connects with the place of origin or destination of your reservation. Once the ticket is issued for a certain day, tickets cannot be reserved for prior days. Reservations for two tickets on the same day are allowed only if there is a minimum 3 hour period between the two trains. The pass holder must comply with the general rules applicable in contractual relations between the passenger and the carrier. Pass holders may change the class specified on their Pass from Business/Club to Tourist class, without being entitled to any compensation whatsoever. Luggage refers to any handheld package that contains garments or personal or work-related belongings that belong to the passenger that does not contravene the safety measures established in laws and regulations and that does not represent a hazard or inconvenience for other passengers. All passengers with a ticket may carry, in their custody and responsibility, in places set aside for this purpose, three hand luggage, with a total limit of 20 kg and not exceeding dimensions (length + width+ height) 250 cm. between the three packages. Passengers must store their luggage in such a way so as to avoid injuring or disturbing other passengers or damages to the train, and will be exclusively responsible for supervising it. Renfe-Operadora will not be responsible for any incidents, theft, lost luggage or damages due to improper storage or unsuitable contents, unless responsibility can be attributed to it. There is no luggage check-in service for Medium Distance trains. If the details on the pass have been altered or tampered with, or if the pass is used by any person other than the holder, the traveler will be deemed to be travelling without a ticket. In such cases, the pass will be confiscated and the prevailing regulations will be enforced as appropriate. If a pass is used without a previously reserved ticket, the traveler will be deemed to be travelling without a ticket and the prevailing regulations will be enforced as appropriate. Unused Passes can only be cancelled through Palace Tours. A cancellation fee of 25% in addition to Renfe charges will be apply to cover the cancellation fee and the operators administrative expenses. The Pass becomes non-refundable after making your first trip. If the trip is made in an inferior class to that specified on the pass, the holder will not be entitled to any compensation whatsoever. Tickets can be cancelled free of charge, online and at rail stations. A ticket can be cancelled up to 15 minutes before the train departs from the origin station. Once a ticket is cancelled, the previous number of remaining trips is restored on the pass. 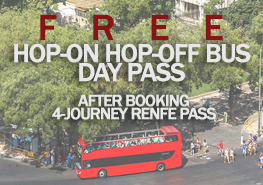 Get a FREE addition after booking a 4-journey Renfe Pass! Click here for more promos! Allows non-residents to easily and quickly travel around Spain at a discounted rate. Children under age of 4 travel free! Choose passes of 4, 6, 8, 10 or 12 trips, to be used within 1 month. Receive your Renfe Spain Pass by email within 24 hours along with instructions on how to make your ticket reservations online and free of charge. If you lose your pass, you can print it again! Complete your trip by commuter train to/from any station within the city of origin or destination, provided that it connects with your place of origin or destination.